Getting a website is the first step you can take to circulating your name for your birth doula, postpartum doula, midwife, baby nurse, childbirth educator, lactation consultant or other childcare related business. A website is one of the easiest and most cost effective ways of advertising your business. We have helped many doulas, midwives, baby nurses, childbirth educators, and infant massage specialists get their businesses up and running with a new website. Many have expressed how happy and satisified they are with their new website and how it has greatly helped in increasing their exposure and amount of business. Since we have worked with many doulas, midwives, baby nurses and other childchild professionals, we are already familiar with your background and what it takes to get your business to the top of the search engines. We will help you to create a website that's appealing for mothers, fathers and new (or growing!) families and that will help you book new clients in your targeted area. Take a look at our recent website designs to see what we can offer you and to help you get a better idea of the kind of customized website we can create for you. All websites are custom designed to your specifications with search engine optimization added to help you get the most of out of your website. We are also more than happy to help you get a website together for your doula group or doula organization, birth center, or birth network. All childbirth professionals and organizations can benefit from using our services! The latest examples of our website design will be displayed here. You can view our full portfolio on our Portfolio page. Are you looking for the old Doula Directory that was listed on this website? You can now find the doula directory resource here. This resource will help you to find websites where you can list your doula or midwife services. Getting links to your website is an important step to improving your page rank in Google. Get your website listed in quality directories and websites to help boost your website to the top of the search engines! Desjean Design is a divison of Sugar Branch Designs, a business partnership between Mary Desjean and Jenny Clinkscales. We are both website designers and developers and we look forward to working with you to create a beautiful new website for your business. You can read more about us and our backgrounds on our website at Sugar Branch Designs. Are you looking for a new website for a non childbirth related website? We can help you! Visit Sugar Branch Designs to find our about custom website designs for all other business or indivdual websites. All of the services offered here and also offered to our other clients. 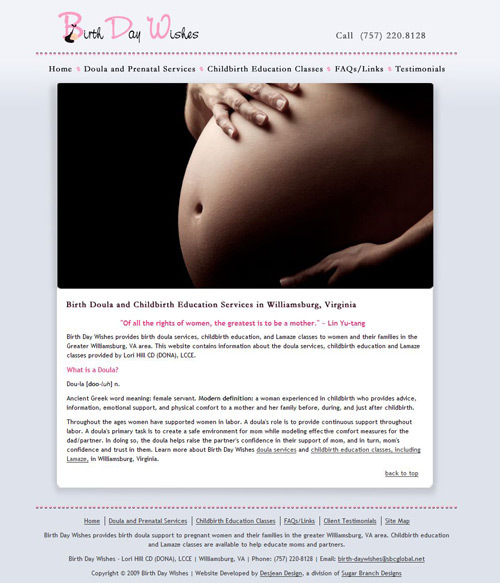 We specialize in custom website design for doulas, midwives, baby nurses and other birth professionals. We offer logo design, website design, blogs, SEO, web marketing and more.